Where did FindaProperty.com go ? 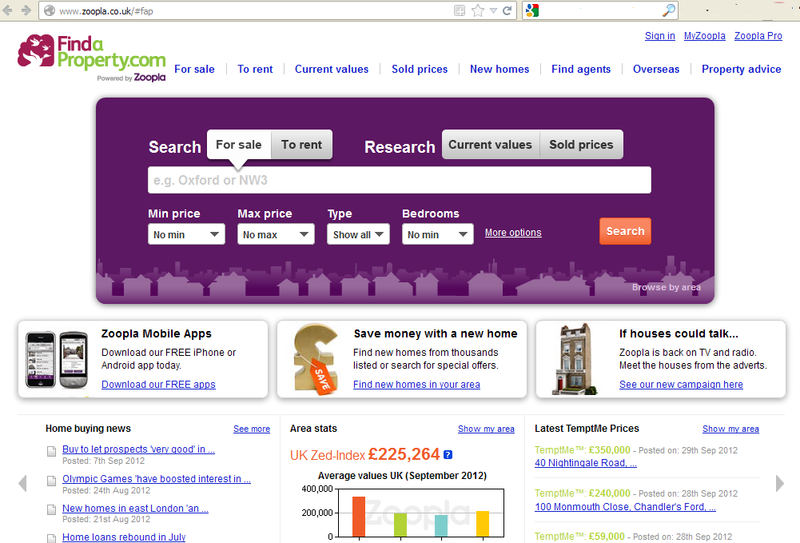 If you are searching for FindaProperty.com as of today, you will be taken to a white-labelled version of Zoopla. FindaProperty.com is redirected to Zoopla, using #fap anchor to determine the page elements including a branded search box. For visitors, there is no explanation for the change. This could cause serious confusion. The Digital Property Group ran a portfolio of websites, each catering for a different audience in order to dominate SERPs and allow for different brand objectives and audience targeting. PrimeLocation.com – Targeting a wealthier, aspirational audience with a south east England bias. Globrix.com – Free to list, and technically the most competent property search site with a vast inventory of property for sale. RightMove.co.uk only ever needed one website, they established themselves as the Amazon of property search, and Zoopla may be picking a difficult fight by simply consolidating a disparate property site portfolio in a head-to-head battle. Rightmove is always the favourite to win, but when you examine the form closely, its not the strongest horse for all races. The Digital Property Group fielded a complete stable for every race. No single horse was good at everything, but over rough ground, or heavy going it was able to field a winner by picking its races carefully and backing the right horse for the right race. Zoopla’s bold move is to pull the various horses from the race, and place the bet on a single horse to win against the favourite. In digital marketing, site consolidation brings the benefits of combined strength and authority. However, property websites are already heavy-weights in their space, whether they receive the larger share of the visits in the long term is down to visitor experience, loyalty and preferred site search features. No visitor is identical, each likes a different aspect of a site. If the FindaProperty faithful do not like their new experience, then this race could be lost before it even starts.